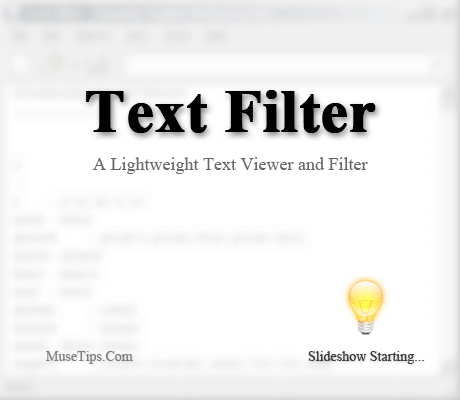 MuseTips Text Filter is a lightweight text file viewer with easy search and filter tools. Text lines are instantly filtered as you type your search phrase, with all matched terms highlighted in a contrasting color. How to extract: Download the "Portable Version" ZIP package and extract to a folder of your choice. Launch TextFilter.exe. Textreme is a tool for "text remodelling", allowing you to change text and modify its appearance by delete blanks or moving/insert words. Great for updating text files with lots of minor changes that would be manually tedious, the program offers a variety of string-based functions (deleting sections, inserting into a specific place, switching bits around, etc.) for text files. There are currently nine different actions that can be performed in various ways and actions can be cascaded in so that many changes can be made in a single pass. Tip: Use "TextEditor="dummy\..\..\PathToYourEditor.exe" to specify an editor with relative path in Textreme.ini. How to extract: Download the ZIP package according to your system and extract to a folder of your choice. Launch Textreme.exe or Textreme64.exe. TypingAid is a fast and simple auto-completion utility that suggests words and phrases in any window. The program supports European languages with accents, suggestion tooltips, and the ability to add words and phrases to word list with shortcut key. The program can help with writing in a language different than the available keyboard, with highly technical or medical terminology, or to help cut down on typing for touch or disabled typists. The program was compiled using an AutoHotkey script and the .AHK source included. How to extract: Download the ZIP package and extract to a folder of your choice. Launch TypingAid.exe. Optionally, you can prepare a list of words, saved as "wordlist.txt" under the same folder as the program file. The zip contains one for general purposes (and the program learns as it goes), but others are available from the homepage. Added the ability to exact match on Window Titles (enquote, or tick the checkbox). Added Word Replacements. In wordlist.txt, use the form |r|. To define more than one replacement per word, simply add the word again on a different line. If Case Correction is off, the case of the first letter will be changed to match the word being replaced. Added Word Descriptions. In wordlist.txt, use the form |d|. Replacements and Descriptions are compatible and can exist on the same word. With fixed width fonts, the description will show in a separate column. Added a setting to control the width of the List Box in pixels. Added Numpad Enter as an autocomplete key. Fixed issues with words that had apostrophes (') in them. Set journal_mode to TRUNCATE so the db journal isn't deleted every time. Minor performance improvements when loading the wordlist. Added a progress bar when loading the wordlist. Added a progress bar when cleaning the wordlist (when exiting the script, the box may appear blank. I think this is because the script is exiting). Added framework for database conversions. Fixed issue with overriding the default font. Found a bug when generating new Preferences.ini files. If you've started anew with TypingAid since v2.19.7, it's probably best to delete your preferences.ini, but it will fix the TerminatingCharacters entry IF you have not modified that entry since the Preferences.ini was created. ** Fixed bug when creating TerminatingCharacters when generating preferences file. Broken TerminatingCharacters will be repaired if not already modified. TypingAid 2.20.0 has been released. It's a total revamp of TypingAid... new database backend, new settings GUI, etc. ** Added a Settings window (thanks to HugoV for doing much of the coding). Emunge performs text search and replace operations with regular expressions (AKA regex); text from the clipboard or entered into the program's left window pane will be searched and the output displayed in the right window pane. How to extract: Download the ZIP package and extract to a folder of your choice. Launch Emunge.exe. 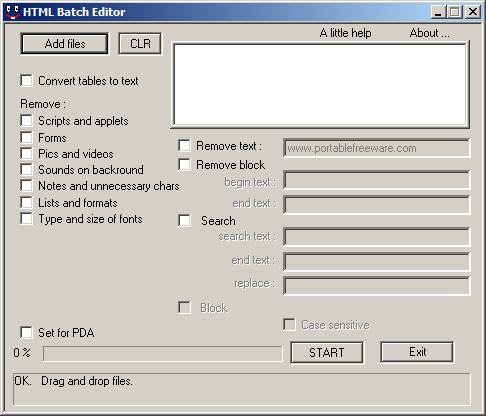 HTML Batch Editor is a simple text file batch processor designed primarily for HTML files. It can do multi-file search and replace and can strip files of complex formatting and certain more advanced content. Very useful for dealing with folders full of scripts or web pages. Site offline; linking to archive.org. How to extract: Download the ZIP package and extract to a folder of your choice. Launch HTML Batch Editor.exe. Program not available.. this entry may needs to be fixed, but I cannot found this version of the program on the web..
Site updated to Baas' archive.org link.